Discussion in 'The Grumble' started by Ruby, Apr 9, 2019. A customer brought in these wedding cake toppers. The customer said they are made out of clay and I can see they are hollow. There is a small hole at the bottom of each fish (not the back side but the bottom). There is a metal wire that loosely pokes into a hole in the mouth of each fish so that the mouths meet up. The customer does not want the tails and heart to be in contact with the mat backboard, but instead wants the tails and heart to stand out from the back board a little distance so that only the rounder bodies of the fish are in contact with the matboard. The distance between tail ends is 7" and the distance from the top of heart to the bottom of fish is 4.5". The customer likes this color and style of frame but it isn't deep enough. The depth of the frame needs to be 2" or so as the fish are 1.5" in diameter. How can I attach these fish? My usual distributors are Don Mar and Larson Juhl and so far I haven't found a frame in the desired shape, color and 2" depth. Any thought? 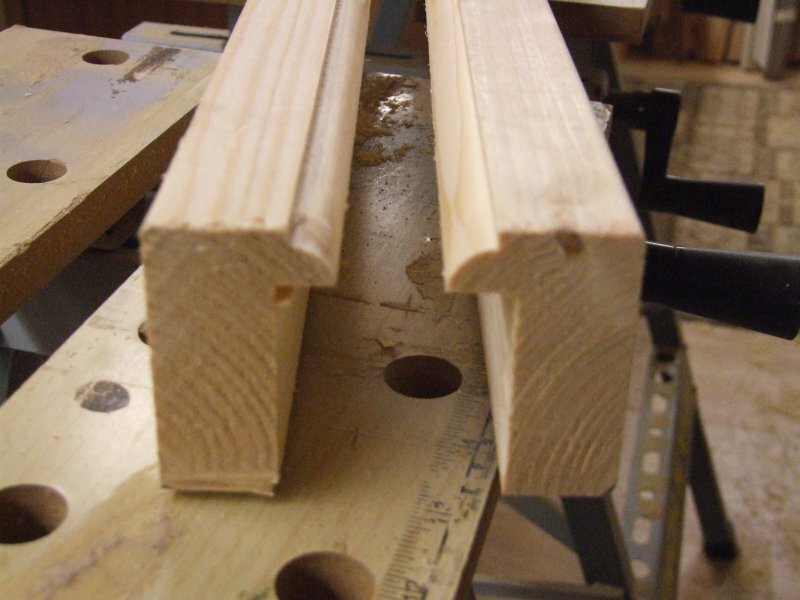 Build out the back of the frame and stain it to match as much as possible. I do this a lot. What is the depth of this frame? If the fish are already 1 1/2" in diameter, you'll need more than 2". 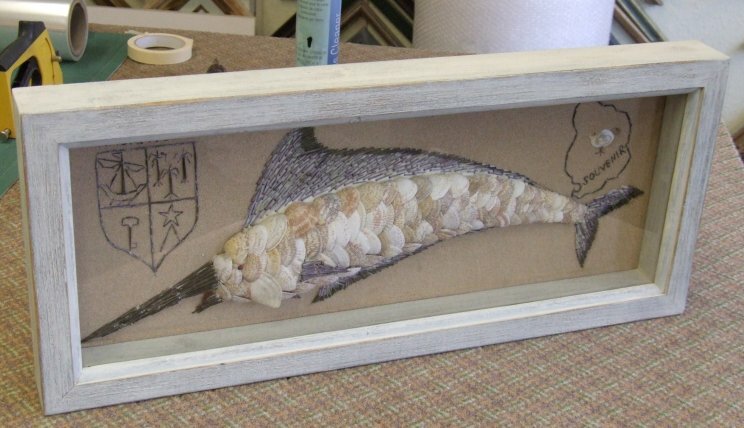 1/16" for the glass at least 1/8 to 1/4 inch space between the glass and the fish and then 1/16" for mat behind and then 1/8" for the foam core and then 1/8" extra space to allow pinning the whole thing into the frame. You would need to make it a minimum of 2" but another 1/4' would be nice. I agree: "You would need to make it a minimum of 2" but another 1/4' would be nice". 2" would be bare bones minimum. The frame that she liked (or something like it) is 1 1/8" deep so if this frame were used it would require a minimum 1" build out. I am not strong in the carpentry area so I would hope to find a frame that didn't require an extension. And then how to attach those fish ??? No friend with a wood shop in their garage or basement? I assume they are light weight. I would attach them so they rest on top of something similar as the cake topper. machining skills..... The timber was 'construction' grade softwood. Ylva, MATTHEW HALE, shayla and 4 others like this. Which frame is she liking. Perhaps someone has a suggested alternative. If not, and the frame is a simple flat profile, you can have 2 identical frames made, and stack them. It doesn't take too much carpentry skill to remove the lip of the back frame. The face of the back frame doesn'y need to look good, as it will be hidden. I'd use some type of stiff wire that fit snugly into the underside hole of the fish, and bent around to the back of the fish to poke through the backer. It'd be fun to have them suspended behind something that looks like water. And made to look like a fish tank, or just swimming free, (in the Pink Fish Ocean). If your customer really wants this frame, are they willing to pay for two of them? You could have someone rip the lip off the second and screw it to the first from the back, with inset screw holes. Or, you could just use one, and get an acrylic box with a lip that sticks out the front. That can be a fun way of creating depth. Hmm.....that might be too much for these guys. I suppose another way would be to use a frame with convex glass, so the curve makes space for them. Inline Ovals can vary the depth of many of their frames. I don't know about budget, but apart from that: Winner-Winner, Chicken-of-the-Sea Dinner. round frame + convex glass = porthole! brilliant. too much with the aquatic theme? I work three ways: Good, Fast, and Cheap. Pick two.